With any product you purchase, it is important to read the label and product data sheet (and assembly instructions, if any) before you purchase it. The data sheet provides you with the physical properties or specifications of the product, defines where or how the product should be used, and details the expected performance of the product. This, in turn, provides you with the information needed to compare competing products and to take performance differences into consideration when evaluating cost differences. For a simple item like a can of soup, you might be looking at calories per serving, sodium content, and whether the soup is gluten, dairy, or soy free. For a riding lawnmower, you may be considering horsepower, transmission type, cutting-deck width, power or manual steering, turning radius, availability of parts and services, and warranty. If you happen to live in California, you need that riding mower to be emissions compliant as well. In the case of flexible elastomeric closed cell mechanical insulation, the most widely specified standards called out in North America are ASTM C534: Standard Specification for Performed Flexible Elastomeric Cellular Thermal Insulation in Sheet and Tube Form, and ASTM C1534: Standard Specification for Flexible Polymeric Foam Sheet Insulation Used as a Thermal and Sound Absorbing Liner for Duct Systems. These standards define properties such as thermal conductivity, water-vapor transmission, shrinkage, service-temperature range, etc. Life-safety properties like flame spread and smoke developed ratings (also referred to as surface-burning characteristics) are also defined. Each of these properties is determined according to a specific test method, but for many properties, multiple standardized test methods are available and used. The ASTM standards also establish minimum performance criteria for each of the defined properties. 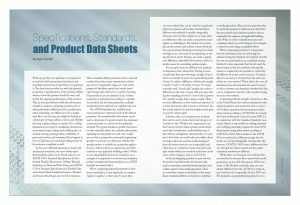 The manufacturer’s data sheets can be used to determine if a product meets the minimum criteria necessary to conform to the applicable standard. The typical insulation product data sheet (or data submittal sheet) also includes information regarding recommended uses and code compliance so that a prospective mechanical engineering specifier or end user can determine whether the specific product is suitable for a particular application (i.e., will it perform to expectation and will it conform to any applicable building codes?). While we are using flexible elastomeric insulation as an example, it is important to note that any insulation product manufactured domestically has an ASTM standard associated with it. When comparing physical properties of insulation materials, it is very important to compare “apples to apples,” as there may be more than one test method that can be cited for a particular physical property, and the data obtained from different test methods is usually comparable. However, even for that simple can of soup, there are differences that can make comparisons meaningless or misleading to the unwary. As an example, are the calories and sodium content listed per can or per serving? If listed per serving, how many servings are in a can (and are you planning on eating all of it at once)? Variance can make a significant difference, especially if, for instance, there is a health reason for controlling sodium intake. For example, there are different test methods to determine water absorption. Testing is more complicated than just throwing a sample of insulation in a bucket of water for a prescribed period of time. It makes a difference whether the sample is under 1 inch or 12 inches of water. For many materials with “closed cells,” sample size makes a difference as the ratio of open cells (cut open during the sampling process) to closed cells is greater for a smaller sample than a larger sample. There are even differences in how results are reported. Is it water absorption after 2 hours or 24 hours? Are the results reported as percent weight (mass) gain or percent volume gain? Likewise, there are numerous test methods that can be used to define the broad category of “reaction to fire.” Within this category, you can find various tests for flame spread, smoke developed, fuel contribution, combustibility, rate of heat release, and ignition characteristics, to name just a few. Some are small scale tests while others are large scale tests, and the results developed from the various tests are not comparable, and often have no correlation. Some tests have multiple results within test methods and these can be more or less stringent, such as with UL94. In fact, by designing a product to pass one test, the product may fail another test, because they may be measuring contraindicated properties, such as flame spread versus smoke generation. These are somewhat counter to each other in that many flame-retardant additives are known to contribute to smoke generation. Thus, it is very important that if a particular property is called out, you check that the test method used conforms exactly to what is required by the engineer and applicable building code. When it comes to specifications and code compliance, there is no such thing as close enough—or almost no such thing, as explained below. When comparing products, it is important that the information you are reviewing was obtained using the identical test method and that the test was performed by an accredited testing facility. It is also important that the lab used the latest version of the test method or the specific version as required by the specifier or code body (if different from the current version). Occasionally, it is necessary to deviate from the exact procedure in a test method. When this is the case, all deviations from the standard test must be noted so that a reviewer can determine whether the data can be compared to data for other products using the exact test method. Continuing with the example of reaction to fire, in the United States, the various mechanical codes require insulation used in plenum areas to meet a 25/50 (flame spread/smoke development index) when tested according to ASTM E84. In Canada, the National Research Council Canada (NRCC), in conjunction with the Canadian Standards Association (which is responsible for writing standards and certifying materials), requires the same 25/50 flame/smoke rating when tested according to CAN/ULC-S102. This is similar to the ASTM E84 test method, but different enough that the results are not interchangeable. Among other differences, CAN/ULC-S102 uses a different air flow rate through the Steiner tunnel and the results calculation methods are different. While there are European test methods that are intended to measure flame spread and smoke generation, such as EN (European), DIN (German), or BS (British) standards, they are completely different from the ASTM test methods, and would not be comparable. In fact, DIN and BS standards are gradually being phased out in favor of the International Organization for Standardization (ISO) standards. There are unique circumstances where some of these other test methods may be applicable. While the code may require that an insulation material meet a maximum ASTM E84 25/50 flame/smoke rating, there are alternative means of evaluation available to determine whether a material that does not meet the specific code requirement can meet the intent of the code, in this case to limit the spread of fire in the event that a fire actually occurs. In the United States, this process is usually conducted through International Conservation Code (ICC) Evaluation Services(ES). The ES may consult with experts in the field of reaction to fire to determine what alternative test are necessary and what levels of performance would be required for these tests. Once the requirements are established and the manufacturer satisfactorily completes the testing, ICC ES can issue an evaluation report describing the product, the code requirement(s), the rationale behind the alternative testing protocol, a summary of results, and the conclusion that states that the product tested meets or doesn’t meet the intent of the code. While this is not the same as complying with the code, the evaluation report is generally accepted by code officials who will approve the product based on the guidance offered by the evaluation report. No growth when tested according per ASTM G21 (quantitative). Mold resistance, performance pass when tested per ASTM C1338 (qualitative). Be sure the standards cited are relevant to the application and the codes in your country/state or province. The test methods used and data cited should be up to date. Be sure the information cited does not confuse standards and test methods. Standards provide performance requirements that the material must meet and the test method that must be used. The test method verifies the performance of the material in line with the requirement of the standard or the test method. Many test methods define material dimensional characteristics. If the user desires, the material could be tested at the thickness being used to get exact performance results. When reviewing data for a particular physical property, for a direct comparison, be sure to compare data obtained using the same test method with the results recorded in the same units. Some test method report several results. For example, in ASTM E96, permeance and permeability are both reported but are different properties and may be used for different insulation materials. For thermal conductivity, make sure to compare the same mean temperature against each other (e.g., Product A’s thermal conductivity at 50°F versus Product B’s thermal conductivity at 50°F). If a manufacturer’s data sheet offers a comparison of performance to other materials, check the data for the other products from their website. Sometimes the comparisons use incorrect or out-of-date data. If the product uses a facer or requires a vapor barrier, look for the data without the facer or vapor barrier, because this is the performance you could well end up with if the facer or vapor barrier is damaged. The installation may be rejected by the local inspector for failure to meet the local building codes and the material may have to be removed, which can be very costly. The product may not perform as expected in the application. Increased liability for the specifier, contractor, and distributor. In summary, information on a product data sheet and reviewing the performance values for desired properties can provide a basis for selecting a material or narrowing the selection of products for a particular application and comparing the performance of multiple products. The data sheet provides all the information needed to ensure the product is acceptable for the application in terms of physical properties and regional code approvals. The information should be specific and detailed, taking much of the confusion out of the product selection process.